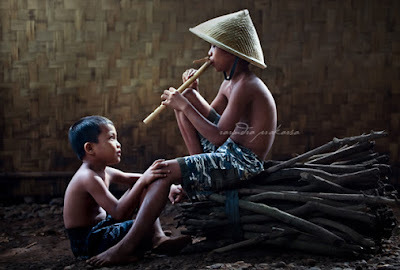 ONCE upon a time in West Java, there was a village. All the villagers were farmers. The land was fertile and the people lived happily and prosperously. Well, actually not every one was rich. There was one young man who was poor. His name was Kabayan. He lived with his mother. Kabayan was not a farmer. He did not have his own rice field. To make a living, he worked for other farmers. He helped farming the rice, herding, and feeding the cattle. Kabayan always played his flute while he was herding. He played very well and many people enjoyed listening to his playing. All the villagers loved Kabayan. He was smart, diligent, and helpful. Kabayan always helped anyone who needed his help. There was one beautiful girl in the village. Her name was Nyi Iteung. She was the daughter of the head of the village. Kabayan was in love with Nyi Iteung. He always tried to find a way to approach to the girl. One day Kabavan went to Nyi Iteung's house. "Hey what are you doing here, Kabayan?" asked Nyi lteung's father. "Well, do you need any help? I mean do you need any help to herd your goats?" asked Kabayan nervously. "No, my goats are fine," he said. "I do, Father," said Nyi Iteung. She overheard their conversation. Well, nobody knew that Nyi Iteung secretly loved Kabayan. "l need him to build a fish pond, Father, " said Nyi Iteung. Kabayan was so happy he could be near the girl he loved. He built the fish pond happily. He did it after he worked. While he was busy making the fish pond, a man came to Nyi Iteung's house. He was a rich merchant. "I'm here because I want to propose your daughter, Nyi Iteung to be my wife, Sir," said the merchant to Nyi lteung's father. "I cannot decide, it's all up to her," said Nyi Iteung's father. Kabayan was angry. He had to find a way how he could stop the marriage. He knew he was not rich so he had to find a smart way. He was thinking hard, and then, Aha! He got an idea. "I know you are rich and you want to use your money to propose her," said Kabayan. "What can I say... I'm very rich,"said the merchant arrogantly. "Ha ha ha... although you are rich but you are not smart," mocked Kabayan. "But I don't have any money. I only have a flute and a hat," said Kabayan. "Now here is my question how far is the distance between the earth and the moon?" asked merchant. "I don't know here please accept my flute," said Kabayan. He continued ,"What animal when it climbs a mountain has four legs but when it goes down it has two legs." The merchant was thinking hard. He was upset because he did not know the answer. He gave up. "Here please accept all my money," he said angrily. "Thank you," said Kabayan. He walked away. "I don't know either. Here take my hat," said Kabayan happily.